Five women say in a federal class action that Estee Lauder, Avon and Mary Kay resumed animal testing of cosmetics for the Chinese market while falsely claiming in the United States that their products are "cruelty free," Courthouse News Service reported. Lead plaintiff Marina Beltran demands $100 million in class damages from Estee Lauder, Avon Products and Mary Kay cosmetics companies. "For years, defendants marketed and advertised their companies and their cosmetic products as not being tested on animals, when in fact defendants were testing their cosmetic products on animals so that they could sell products in China and other foreign countries, thereby reaping hundreds of millions of dollars in sales," Beltran's suit alleges. "Defendants later purported to disclose, at least on their websites, that they in fact were animal testing, but the disclosures were wholly inadequate and deceptive," the complaint states. According to the 18-page complaint: "As a result of the aforementioned representations, defendants, for over two decades, achieved placement in the 'People for the Ethical Treatment of Animals (PETA) - Do Not Test' list, a list of, among others, cosmetic companies that do not test products on live animals. Defendants were, until a matter of weeks ago, among the largest mainstream corporations to be included on PETA's cruelty-free lists. "As a result of being included on the list, as well as many similar lists, defendants enjoyed the support of PETA and millions of consumers who buy cosmetics only from companies that do not conduct animal testing," the suit charges. "Simply put, defendants reaped hundreds of millions of dollars in revenue from U.S. consumers who otherwise would not have purchased defendants' products." PETA's Cathy Guillermo told Courthouse News that the animal rights organization was "extremely upset" when it learned that the cosmetics companies had tested their products on animals. "It appears these companies have misled some consumers, and it appears that the plaintiffs may have a valid complaint here," Guillermo said. Avon spokeswoman Jennifer Vargas told Courthouse News in an emailed statement that she could not comment on pending litigation. "What I can tell you is Avon's commitment not to test on animals is the same as it has been for over twenty years: except where required by local law, Avon neither conducts nor requests animal testing in order to substantiate the safety of its products," Vargas wrote. 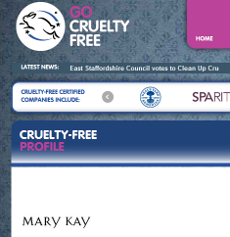 Mary Kay said in an email that it did not conduct animal testing "except when absolutely required by law." "There is only one country where we operate where that is the case and where we are required to submit our products for testing - China," the company told Courthouse News in an email.